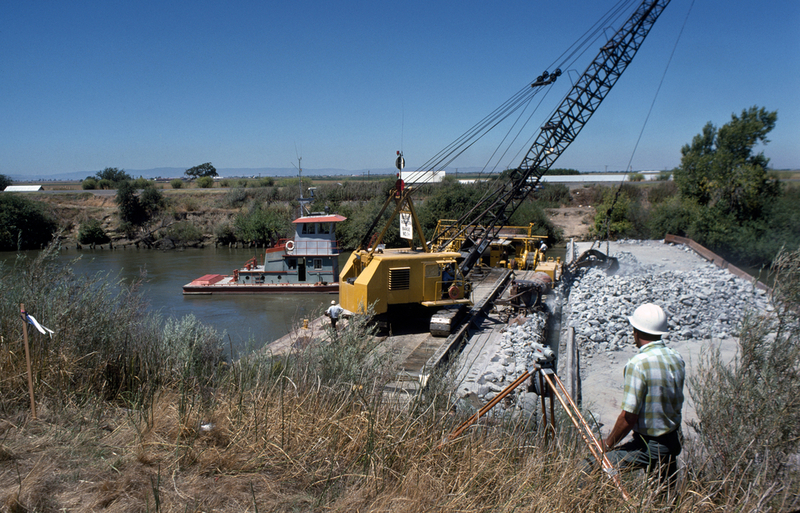 A rock barrier was installed across Sutter Slough in the 1976 drought to control water salinity upstream. This week, California water officials began constructing another temporary barrier in response to the current drought emergency. Click image to enlarge. On May 8, the Department of Water Resources began constructing a temporary rock barrier, in effect a small dam, across one of the delta’s interlinking channels. The goal of the $US 28 million project is to 1) keep the salty Pacific Ocean from creeping inland and souring a drinking water source used by two-thirds of Californians, and 2) to preserve water storage in depleted upstream reservoirs. The barrier will be removed in November. The last time California erected barriers in the delta to prevent salt water intrusion was during the drought of 1976 and 1977. The new construction is the latest in a series of historic actions that California water managers are taking to limit damage and ensure sufficient supplies of fresh water in an increasingly dry state that uses more water than any other. Earlier this week, the State Water Resources Control Board approved the first-ever mandatory restrictions on urban water use. Last month, the board began cutting access for farmers and industries that withdraw water from the Sacramento and San Joaquin rivers, which form California’s most important watershed. Two other barriers — on Miner Slough and Steamboat Slough, both in the northern delta — were considered but ultimately rejected, Carlson said. The U.S. Fish and Wildlife Service was concerned about harming the Delta smelt, an endangered fish whose numbers are at a record low. Construction of the barrier is already being challenged in court. On May 9, the Center for Environmental Science, Accuracy, and Reliability, a public-interest science agency, sued to halt construction until a deeper environmental analysis is completed. Typically, enough fresh water flows out of the delta to keep salinity at an acceptable level.in the west coast’s largest estuary. But this year moisture is so scarce and reservoir levels so low that a physical barrier is needed, the Department of Water Resources asserts. The delta is a drinking water source for several communities in the San Francisco Bay area, and a source of irrigation water for local farms. The water is also pumped into state and federal canals, and delivered to customers in Los Angeles and San Diego. Carlson said the rock barrier is being placed in a channel where salt water is most likely to push eastward. Over the next six weeks, barges will build an 800-foot-long barrier across West False Creek, which connects the San Joaquin River to Franks Tract, one of the delta’s largest water bodies. Jon Burau, a U.S. Geological Survey scientist who studies the delta, said that preventing too much salt in Franks Tract is important because water managers have little control over water quality in the tract, and they do not have enough reservoir storage to flush out the delta. Burau said that the barriers are an effective risk management strategy for holding down salinity levels and saving water in reservoirs. The State Water Resources Control Board issued a water-quality permit for the project on April 30. The board concluded that the barrier allows water managers to hold more water in upstream reservoirs. Preserving storage now is important in case next winter is dry. It is the same argument the Water Board used to justify the mandatory urban water restrictions. “Due to the drought conditions, a scenario without the barrier would likely require additional water releases to control salinity and the additional water would not be available later in the year for other beneficial uses,” the board wrote in its permit approval. The permit also sets limits on sediment in the water resulting from building the barriers. Installing the barrier is not without consequences. Boaters will be inconvenienced and have to take detours. A fish migration route will be temporarily closed. The risk of toxic blue-green algae blooms also increases, Burau said, especially in Franks Tract. The barrier will reduce the daily mixing of salty and fresh water. Less mixing means clearer water and deeper penetration of sunlight, which leads to more photosynthesis and a higher risk of algae blooms. The Department of Water Resources considered installing barriers in the delta last year, but late spring storms in the Sierra Nevada lifted reservoir levels high enough that the barriers were not needed. $28 million blown on a project with a 6 month lifespan? How many acres of flood-irrigated alfalfa could have been permanently fallowed earlier in the drought @ 6 acre-feet per acre per year? I’m recalling here the Bass Brothers of Texas buying up 45,000 acres (10% of irrigated acres in the Imperial Valley) for something like $80 million as part of the San Diego Water District fiasco.